What does a marine mammal trainer do? Would you make a good marine mammal trainer? Take our career test to find out how you match with this and over 800 other careers. What is a Marine Mammal Trainer? There are about 100 species of aquatic or marine mammals that depend on fresh water or the ocean for part or all of their life. A marine mammal trainer cares for and trains marine life such as sea lions, dolphins, walruses, porpoises, manatees, killer whales, sea otters and polar bears. Apart from the training, they are responsible for the animal's mental and physical health, preparation of food, performing maintenance duties, giving trainer tours, interacting with the public, and keeping up-to-date records about the animals. 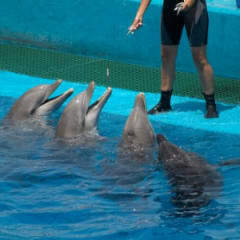 Most marine mammal trainers have a formal education in marine biology or animal behaviour. It is just as important to get hands on experience, learning and becoming familiar with all aspect of the animal's behaviour. Training marine life is a large undertaking and takes a lot of responsibility. Are you suited to be a marine mammal trainer? Marine mammal trainers have distinct personalities. They tend to be investigative individuals, which means they’re intellectual, introspective, and inquisitive. They are curious, methodical, rational, analytical, and logical. Some of them are also enterprising, meaning they’re adventurous, ambitious, assertive, extroverted, energetic, enthusiastic, confident, and optimistic. Does this sound like you? 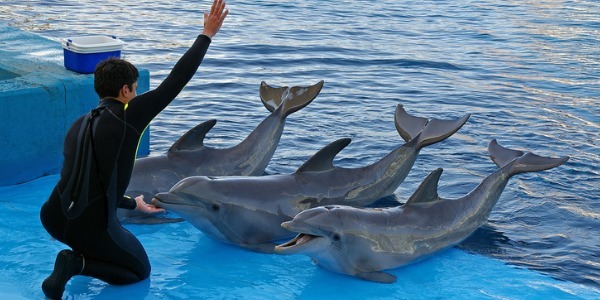 Take our free career test to find out if becoming a marine mammal trainer is right for you.